The Namib-Naukluft Park is famous for its wide-open spaces, massive dunes, endless grassy plains and variety of desert-adapted wildlife. One of the most exciting ways of exploring this unique part of Namibia is most certainly on horseback. The area allows for unrestrained riding that will enable you to truly appreciate the rich biodiversity and free-ranging plains game found here. The wild inhabitants in this – one of the most scenic desert landscapes in the world – are much more accepting and less hindered by human intrusion when you are on horseback than when using any other form of transportation. A horseback safari truly is the best way to get up close and personal with nature. 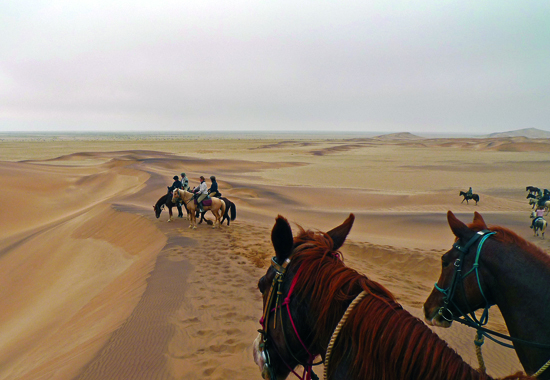 Horseback safaris in the Namib-Naukluft Park often entail travelling along established horse trails into the surrounding plains and watercourses, over dunes and mountain paths, with passing gemsbok and springbok grazing languidly around you. Trips vary from sundowner and breakfast rides to sleep-outs that can extend from one to six day trips, depending on the establishment. Such sleep-outs cover distances ranging from 20 km to 50 km a day, and are usually accompanied by advance teams, which set up camps to welcome the riders at the end of a long day’s journey. 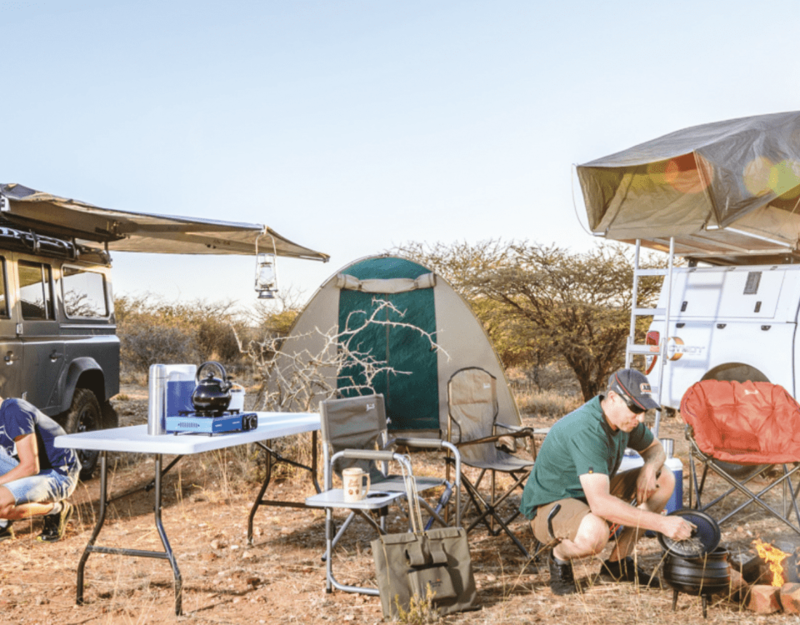 Evenings on sleep-out rides are spent under a dazzling canopy of stars – something that the unpolluted Namibian night sky can offer par excellence. Rides are tailored to suit each rider’s ability, thus offering adventure for beginners ranging through to well-established riders. To make the most of the horseback safaris though, riders are advised to be fit and healthy. Confidence in the saddle will make this adventure all the more enjoyable and allow for better riding experiences and more choices of terrain and thus locations to visit. 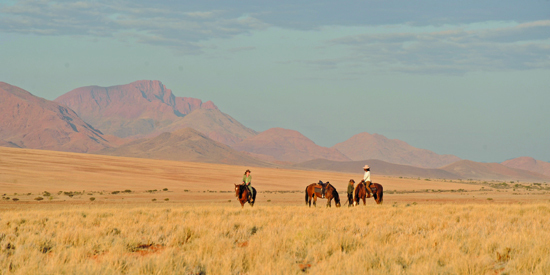 There are several companies that provide horseback adventures in the area, including Desert Homestead & Horse Trails and the Namibia Horse Safari Company that facilitates rides at Wolwedans, both in the NamibRand Nature Reserve. Horse trails at BüllsPort into the Naukluft Mountains and Klein-Aus Vista environs, traversing the Sperrgebiet Rand Park, are also available. The Namibia Horse Safari Company also offers a number of additional riding opportunities in other parts of the country, including the Namib Desert Ride from Khomas Hochland to the Atlantic coast; the Greater Fish River Canyon Ride along the edge of the world’s second-largest canyon; the Damara Elephant Ride, which takes you to search for the desert elephants in Damaraland and along the Skeleton Coast; and outrides at River Crossing Lodge, 3 km outside Windhoek. 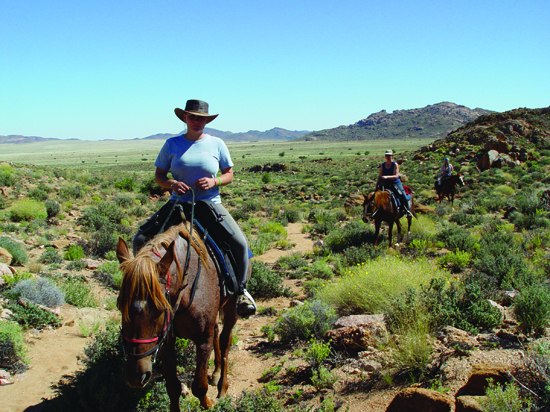 Other trips available in and around Windhoek include six-to-eight-day rides at Okapuka Lodge with Okapuka Horse Safaris and a variety of trips and lessons offered by Equitrails Namibia, situated 15 km north of Windhoek. The Namibia Endurance Ride Association (NERA) holds endurance competitions across the country throughout the year, while other equestrian sports such as show jumping and dressage are organised by the Namibian Equestrian Federation. Travel News Namibia is a high-quality glossy Namibia travel and lifestyle magazine tasked with promoting Namibia to the world. With riveting stories, first-hand encounters and magnificent photographs showcasing tourism, travel, nature, adventure and conservation, TNN is the ultimate and most comprehensive guide to exploring Namibia. Travel News Namibia is published in five different editions per year. These include four English- language editions and one German. Travel News Namibia is for sale in Namibia and South Africa.